Easter card inspired by a sketch! 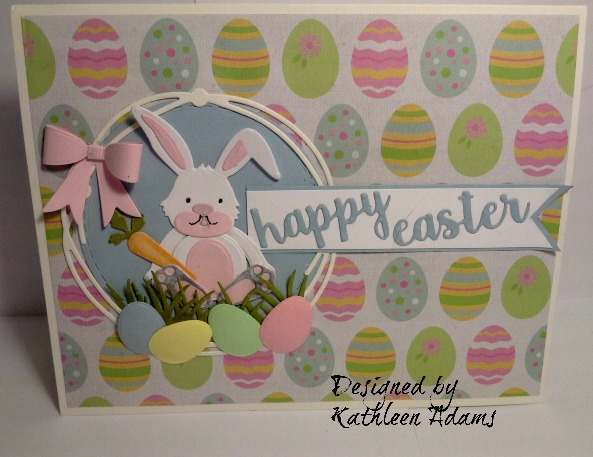 April 19, 2019 Kathleen Adams1 Comment on Easter card inspired by a sketch! Yep, my favorite challenge is Sketch Week! But this time is also Easter week, so I made my card an Easter theme. You know, “two birds/one stone”! Plus, this one is fast and easy! So let’s make this. Step: Pick a designer paper or card stock I chose a paper sold by sheet from Michael”s Craft Store. But the sketch is generic for what ever theme you want. so choose a print that goes with the object that will be featured in the circle. Cut a rectangle from your choice that measures 5.25″ x 6.75″. Step 2: Make a base card by scoring a 8.5″ x 11″ piece of card stock at 5.5″. 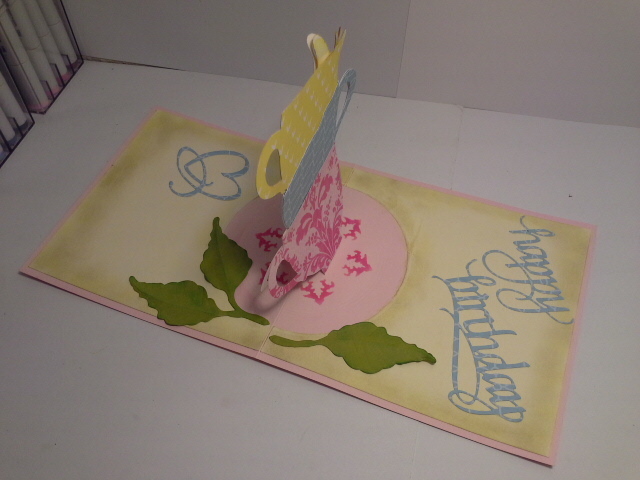 Fold over for a tent card. Trim to 5.5″ x 7″. Adhere the rectangle from step 1 to the front of the base card. Cut a circle with Blue Card Stock. Cut an entwined circle with white card stock. Cut 4 eggs, the bow and 4 grass pieces from the Spring basket die set. Cut all the pieces for the bunny and assemble him. Cut the words “Happy” and “Easter from blue card stock. Step 6: I cut two fishtail banners: one white and one blue by hand. (The white one slightly smaller than the blue) Adhere the white over the blue and then add the “Happy Easter” words to the banner. 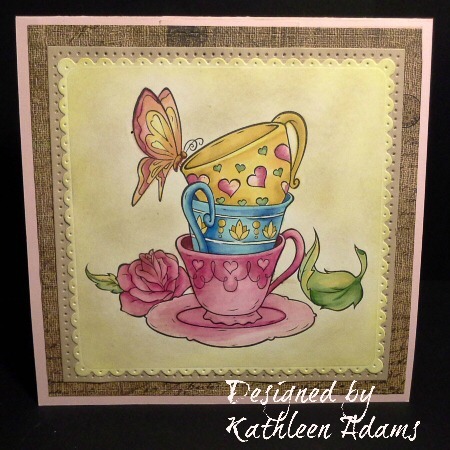 April 13, 2019 April 7, 2019 Kathleen Adams2 Comments on Anything But A Card! The theme this week is to make an “ABC” or Anything But a Card! I have to admit that I made this Spring Trio for my oldest daughter in February but I also thought it would be a good inspiration for a gift for someone for any occasion or to hang in your own kitchen or dining room. I used 3 different black and white prints from a card stock pack from Michael’s Craft Store. I used black card stock for the saucers. I made enough for 7 pansies. Step 3: Assemble the cups and saucers and adhere to each white oval Glue the saucer in place and then put a large foam dot under the cups in the center of each. When you like where it is on each saucer then add a line of glue around the underside edges of the cup. Press the bottom edge down on the saucer. Next remove the “dot” backing and press the cup in place. Now go around and press the rest of the edges of the cup down. Thanks so much for stopping over and I hope you’ll come back soon! March 29, 2019 March 29, 2019 Kathleen AdamsLeave a Comment on For April Fools Day! The front of the card. Because April Fools Day is right around the corner, Francis Byrne, this month’s hostess gave us the challenge to make a card with some kind of trick like a pop up! I love pop ups so that’s what I made. I cut a brown sort of linen print mat with the same die set above. 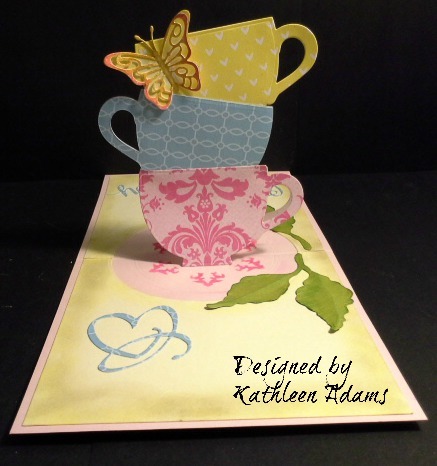 Step 2: Using a now discontinued Karen Burniston’s 103 – Cup Pop Stand – 6 die set. I looked over at YouTube to see if the assembly video is still available just in case you could find this die set on EBay., but it has also been taken down. Step 3: Make a base card by scoring an 8.5″ x 11″ pc. of card stock at 5.5″ on 11″ side. Trim to a 5.5″ square tent fold base card. This is when you start the Pop Up die cutting process. If you have this die set from Karen, then you know how to die cut what will become the “Cup Pop up” inside the card. The lower picture shows that both sides of the stacked cups are the right side of the designer card stock. You can make this happen by cutting the cup once with the die taped to the right side of the card stock and cut a second cup with the same card stock but tape the die to the wrong side of the card stock. Then you adhere them together which makes “no wrong side” cups! March 16, 2019 March 15, 2019 Kathleen Adams1 Comment on It’s Sketch Week! Step 1: Cut two of the one on the right using black card stock on the body pc. and red card stock for the wing pc. Step 2: Using Elizabeth Craft Designs:1116 – Stitched Circles 4th largest die cut one from white card stock. Step 5: Cut two rectangles from green polka dot card stock the measures 6.75″ x 2.5″. Step 6: Create a base card by scoring an 8.5″ x 11″ pc. of white card stock at 5.5″. Fold over for a book fold. Thanks so much for taking a look. I can’t wait to see your version of the sketch! The background “wood look” cardstock is also from Elizabeth Craft Designs and is 6 x 6″ and has all different wood texures from photo’s taken by Els Van de Burg, the owner. This collection of card stock packs came in wood, Metal and stone and is on sale right now for $1.95 per pack. The sentiment “Hugs” is an ECD dies set called: 1269 – Love Sentements. So the challenge for this week is to put a pet on your card. It doesn’t have to be a dog. So this is how I made my card. Step 1: I used some discontinued: Karen Burniston dies for this card, but the link in red will take you to her online shop where she has comparable products. I like to cut all the elements I might use for the projects first so I can audition them on my project. I used Karen’s “Buster the Dog” , “The All Seasons Tree, Props 4 set (dog bowl, ball & dog bones), “Props 2” (party hat) and “Outdoor Edges” grass. 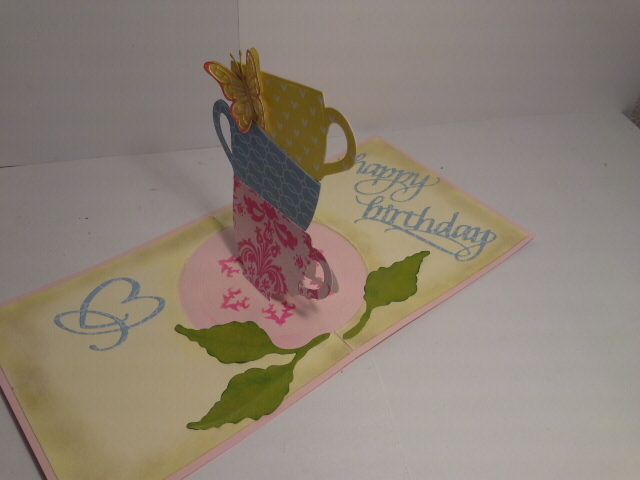 The sentiment “Happy Birthday” is a Elizabeth Crafts Designs die set. Thanks so much for taking a look and I hope you’ll join us in the challenge this week. So my second challenge for all of you who like to play along is to make a Valentine’s Day card. February 9th is actually National Tooth Ache Day! I know! Who makes up this National Calendar of Days? But Thursday is Valentine’s Day! So here’s the steps to my Design Team inspiration card. I used a heavy 110 lb. card stock because I like the deep embossing that results from heavier paper. Now adhere the taped two dies onto black cardstock and run through your die cutting machine. The results will be a stitched black frame that fits perfectly over the embossed panel. Don’t adhere them together yet. Step 3: Create a base card by scoring a pc. of white card stock at 5.5″ on the long side. Fold over for a book fold card. Trim to 5.25 x 6.50″. Cut a rectangle from red card stock (any weight} that measures 5 x 6.25″. Adhere to the base card, centered, leaving a 1/8″ border on all sides. Now adhere the white embossed panel onto the red panel, again centered. Now adhere the black frame over the embossed panel. Cut a red card stock rectangle that measures 5 x 6.25″ and adhere to the inside right of the base card. I printed the sentiment I created in word on white card stock and then cut out the large white heart with my Silhouette machine. I cut the same red heart as on the front for the little red heart and used black and white baker’s twine to make it look like the red heart was hanging on a string! Thanks so much for taking a look. Please join us over at: Crazy4Challenges this week! We want to be inspired from your Valentines Card. This month I am the hostess all month! Which just means it’s my turn to come up with some fun challenges for the month of February. Today is Ground Hog Day so the challenge is to put a ground hog or any other ground critter on your card. I don’t have a Ground Hog but I do have a Hedge Hog! This card is easy! Step1: I cut the body of the hedge hog pc. and apple pc. from white card stock, the leaves from green card stock and the spiky pc. from brown card stock. I colored the body pc. and the apple with Copic Markers. I sponged a darker brown ink on the edges of the spiky pc. Assemble the hedge hog and adhere the leaf to the apple. The clouds are from a discontinued Karen Burniston die set called “The All Season Tree”. I use this die so often that I don’t even put it away. I cut it 3 times and adhered the 3 together to make it dimensional. Step 3: Make a base card by scoring an 8.5 x 11″ pc. of white card stock at 5.5″ on the long side. Fold and trim to a 5 x 6.5″ with a tent fold. Using the largest die from Elizabeth Craft Designs: 1120 – Stitched Rectangles Cut a mat from from a light blue card stock. I adhered the apple, hedge hog and clouds with foam dots and the “hello” sentiment with Beacons Kid’s Choice Glue. Thanks so much for stopping by. I’d love to see your ground critter card! When you click on the product link above, there is also the assembly video. You really need to watch the video before you attempt to assemble this die set. The fish tail banner on the front is from Gina Marie’s Nested Fishtails.